A "key" instrument of the batucada, the smaller drum, the higher pitched and drier. But make no mistake, this is also one of the most powerful, especially if you play with a special stick with several strands (earplugs recommended!). In addition, each strand striking at slightly offset beats, it gives an illusion of greater number. 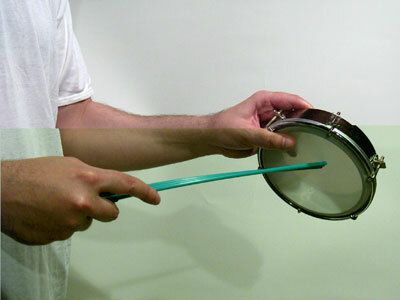 Thus, three players with three strands tamborim sticks, give the effect of a group of 9 percussionists, for example. 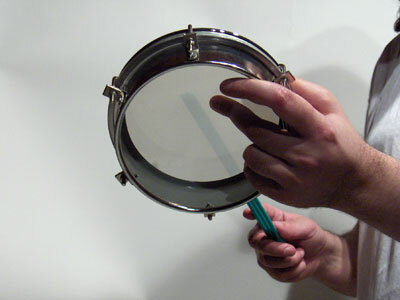 The tamborim, a kind of tambourine without "jingles" ("cymbalettes"), is found in Morocco ("Bendir") and Ireland ("Bodhran"), but in both cases it is large and is not play at all in the same manner (with the hand for bendir and a bat (or "beater": thick stick) with "double end" (big round tip) for bodhran). A basic pattern of tamborim inspired the melodic accompaniment of the famous song "Aquarela do Brasil" (Ary Barroso, 1939), soundtrack of the equally famous "Brazil" by Terry Gilliam. 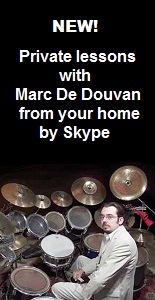 It is anyway one of the most typical samba rhythms and often used by Brazilian guitarists, who try to imitate the batucada, playing at the same time polyrhythmically the surdo with the thumb (like João Gilberto to name only him). When you play that rhythm, the middle finger of the hand holding the tamborim usually played in rests, hitting the underside of the skin. The second fundamental rhythm of tamborim is called the "standard variation" and use the physical specificity of the instrument: its lightness and holding by hand. This is to give 3 strokes by hitting down and the fourth up by lifting the stick and returning the tamborim, which allows a fast and continuous flow with one hand and without rebound (difficult to explain without showing visually, which may explain the need for oral transmission). A typical batucada introduction form, is to start each tamborim one after the other, with slight variations in rhythms to create a polyrhythmic interweaving and accentuate the impression of number. 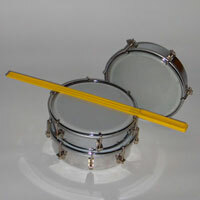 The tamborim is the instrument that inspired the "jazz-samba" drummers for the use of cross-stick, and can be played constantly improvising, accompanying a guitar solo. Finally, the tamborims section, if he is expert, plays usually breaks or "choruses" in unison, which can be customized and original for each samba school, which greatly embellished the batucada.